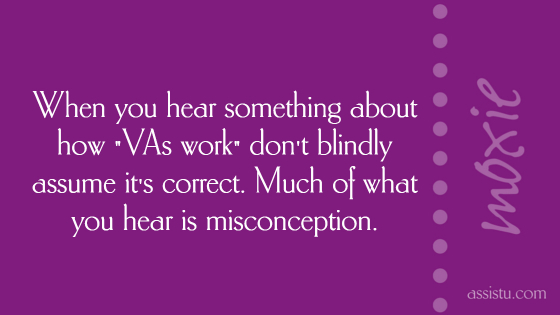 It’s difficult for us to see the thoughtless and often-times brainless comments people make based on their misconceptions about working with VAs. We say thoughtless and brainless because we believe if they gave it just a bit of noodling, they’d choose to disregard it. To help with that, we wanted to share some of the worst, in the hope that folks will be able to see things more rightly. When you work with a VA, you’re buying time, not outcomes, and not results based on quotas. In fact, working with a VA is a terrific BoGo (buy one, get one), in that you get the hour your VA is paid for, and reclaim an hour to spend doing something else that has more value to you. It’s not her job to generate revenue. Yours is. Her job is to help behind the scenes with administration and operations. 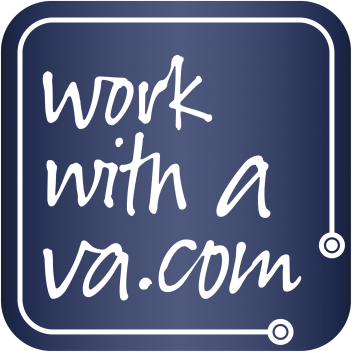 A VA is a professional in her own right and your absolute professional equal. She can do things you can’t, will do things you won’t, and deserves every single bit of your appreciation and respect. She’s not someone who will be at your beckon call, be available around the clock, be there in emergencies outside her business hours, clear her vacation with you, work according to your schedule, fill out your job application, let you treat her like an employee, etc. If you wouldn’t expect something of a different type of professional (doctor, plumber, esthetician, consultant, etc), don’t expect it of your VA. Cutting to the chase on this one, if you’ve been in business for yourself for more than a minute, you have to know that you can’t be profitable in your business if you’re paid $15-20/hour, so why would you think a VA can do it? What’s “good” about not being profitable or able to provide for yourself? If a person learned 500 new things every day of her life, and died at 90, she would still not know how to do everything. So, it stands to reason that no VA on the planet will know how to do everything you need to have done, now, or in the future. Let her learn and grow with you. And, be open to having her find alternative ways of helping you, like finding other professionals to add to your team to do things that she doesn’t. We find that when people say this, they mean that VAs should specialize in one thing, like bookkeeping, or content creation, or social-media management. The truth is that VAs are administrative and operations specialists. Admin and ops is their zone of genius. People who specialize in anything else may call themselves VAs, but would be far better off calling them something more in alignment with the work they do, like Bookkeeper, or Writer, or Social-Media Manager. She’s not Costco. It doesn’t cost her more or less to sell you one or 20 hours. And it’s of no benefit to her, whatsoever, to discount what you pay her the more work you want to give her (by the same token, it also shouldn’t cost you more when you buy over your retainer). It’s also no benefit to you, because if she’s not profitable, she won’t be working as your VA for very long. We hope this helps… what other misconceptions would you add to the list?